Alex Rodriguez will miss four to six months recovering from surgery to treat a painful left hip condition. Yankees general manager Brian Cashman announced yesterday at baseball’s Winter Meetings. A-Rod will have surgery next month by Dr. Bryan Kelly at the Hospital for Special Surgery. According to George A. King III in The New York Post, Cashman told reporters that the Yankees third baseman will undergo surgery to “repair a torn labrum, bone impingement and the correction of a cyst.” Rodriguez underwent surgery on his right hip in 2009. Labral tears of the hip and impingement of the joint are injuries that orthopaedic sports medicine surgeons diagnose much more often than we did in the past. 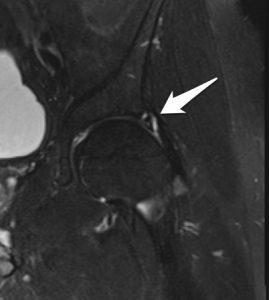 Advanced MRI capabilities and arthroscopic surgeries can identify these causes of hip and groin pain early, often before long-term degeneration of the hip occurs. Without being involved specifically in his case, I can explain generally what Rodriguez’s injury and surgery entails. The labrum is the cartilage bumper along the acetabulum (or hip socket). Athletes often tear the labrum with twisting motions or repetitive impact of the hip over time. 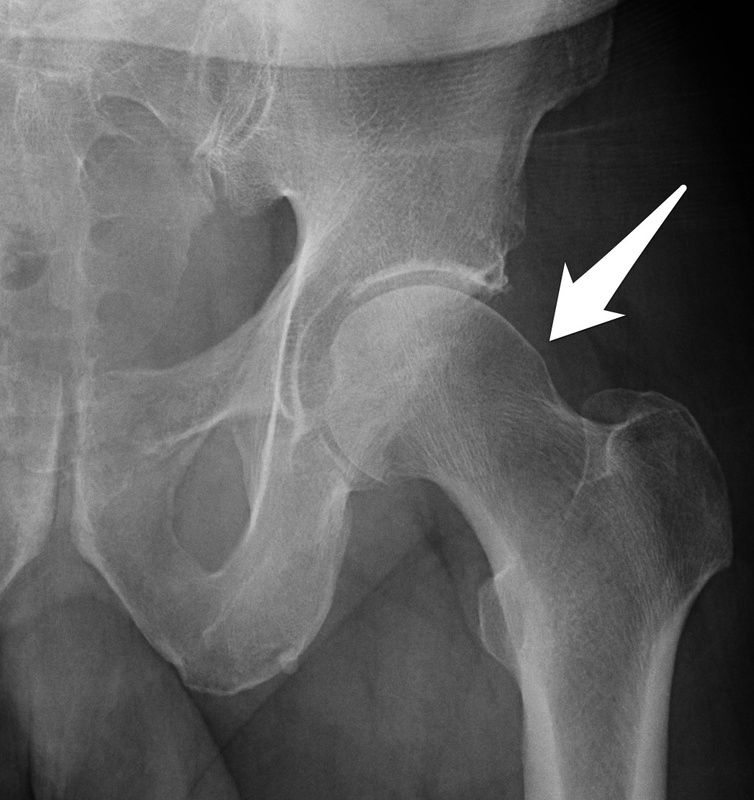 This x-ray of a left hip shows bony prominence of the femoral head and neck consistent with cam-type femoroacetabular impingement. The impingement Rodriguez has is likely a form of femoroacetabular impingement. In layman’s terms, extra bone develops, either on the acetabulum or on the head and neck of the femur. That extra bone can catch in certain hip positions. Femoroacetabular impingement often involves both hips. Many people have x-rays that demonstrate this prominent bone even though they don’t have symptoms. In athletes that twist or pound on the impinging hip, nagging pain can develop. Labral tears and later degenerative changes can occur as well. Additionally, there is no evidence of a relationship between athletes with labral tears of the hip or femoroacetabular impingement and the use of performance-enhancing drugs. Since surgical treatment and rehabilitation can be a lengthy process, athletes often try to manage their symptoms and play through pain. If they don’t improve with rest, anti-inflammatory medications and physical therapy, then surgical treatment is indicated. Most cases of hip labral tears and impingement can be treated with an arthroscopic surgery rather than an open procedure. The surgeon will use a shaver or burr to smooth out or remove the prominent bone. He will either smooth out or reattach the labrum to the acetabulum. This MRI image of a left hip shows a labral tear (white arrow). In Rodriguez’s case, Cashman used the words, “repair a torn labrum,” so it is reasonable to assume that Dr. Kelly will reattach the cartilage bumper with stitches and/or anchors in the hip. Labral repairs require time to heal. Often the athlete must limit weight, motion, and rotation on the joint for 4 to 8 weeks. As the repair heals and the pain from the bony work resolves, motion and strength work can start. The overall process for return to sports for these operations can take up to six months. Fortunately, these labral/impingement surgeries are thought to have good success rates in high-level athletes. A 2011 study by J. W. Thomas Byrd, MD, and Kay S. Jones, MSN, RN, published in the American Journal of Sports Medicine, found that 95% of professional athletes returned to their previous level of sports competition. Yankees fans will follow Rodriguez’s progress closely over the coming months. While he faces a significant operation next month, it seems likely that he will recover over time. Note: This post appears in a modified form as an article I wrote for Bleacher Report.